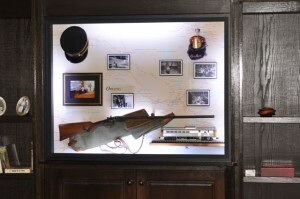 Framing project that included a hat, a gun & case, a bottle of liquor, a map, photographs and interiour lights…made to slide into a custom made bookshelf. Combining the skills & experience honed from many years of practising the fine craft of picture framing with the use of today’s best technology, Walkerworks Picture Framing makes it worth the drive to Stittsville when it comes to finding your custom picture framing shop in the Ottawa area. 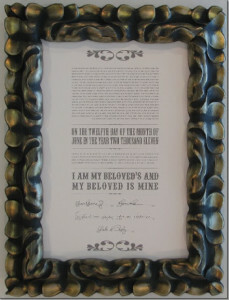 This marriage certificate looks beautiful in this exquisitely ornate frame. Whether you want to display your Grandmother’s Petit point, showcase your Great-Uncle’s war medals, preserve and enjoy your family’s photographs, decorate with your children’s drawings, get those vacation keepsakes on the wall to see, update the framing on your old oil paintings or own a fabulous one-of-a-kind conversation-starting masterpiece, the framers at Walkerworks Picture Framing can do it. We start at the design table with your piece, you and one of us. 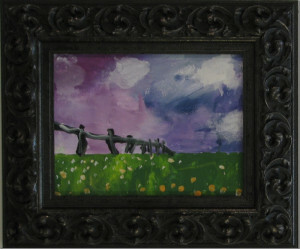 Perhaps you know exactly how you want your piece framed, but maybe you don’t. 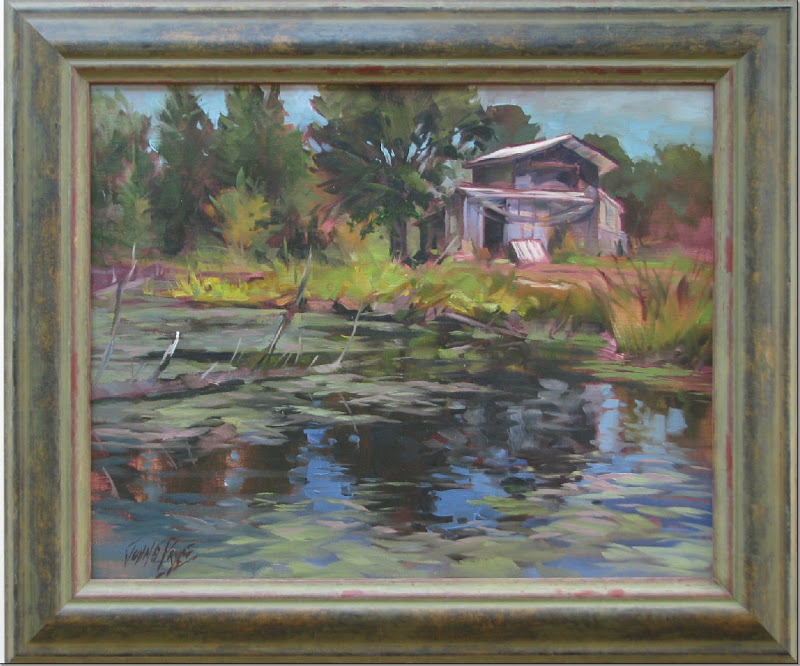 The Certified Picture Framer® helping you at Walkerworks will work with you and your tastes, budget and desired outcome to settle on a custom design that not only suits your piece, but compliments it as well. Choosing from our large selection of acid free mat samples and from our huge variety of mouldings, we always find a look that is unique and perfect for your piece. From multiple mats to fillets to bevel accents, shadowboxes and multi-opening mat packs and float mounting, there is a multitude of interesting design options available. As Walkerworks is a conservation framing shop, you may rest assured that your piece will be framed with only the latest in preservation materials and techniques. All work is done in-house by either Jim or Amy, so the framer who designed your job with you is the one who will be completing it for you. Finishing off your design (unless glass is not needed) is an ultraviolet light inhibiting glass, either Conservation Clear or Museum Glass, that will protect your piece from damaging UV rays, found in sunlight but also in some forms of indoor lighting such as florescent. Walkerworks has proudly been a member in the North American wide Professional Picture Framing Association (PPFA) since 1995 and as such we stay up-to-date with the current knowledge in the picture framing industry and benefit from the continued education and exchange of ideas that comes with being part of a larger governing body. Bring your piece in today and let us show you how great it can look! 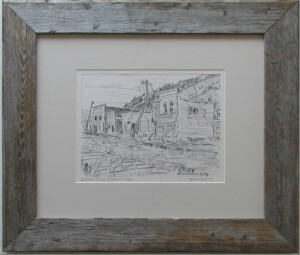 This drawing of Dawson City benefits from an authentic barnboard frame, made by Jim. 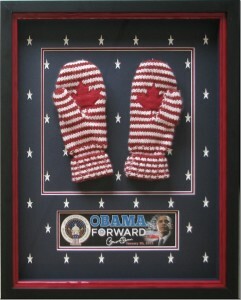 This project combines a bumper sticker for President Obama’s 2013 inauguration with the mittens that our clients wore to the event in a stars and stripes themed shadowbox. 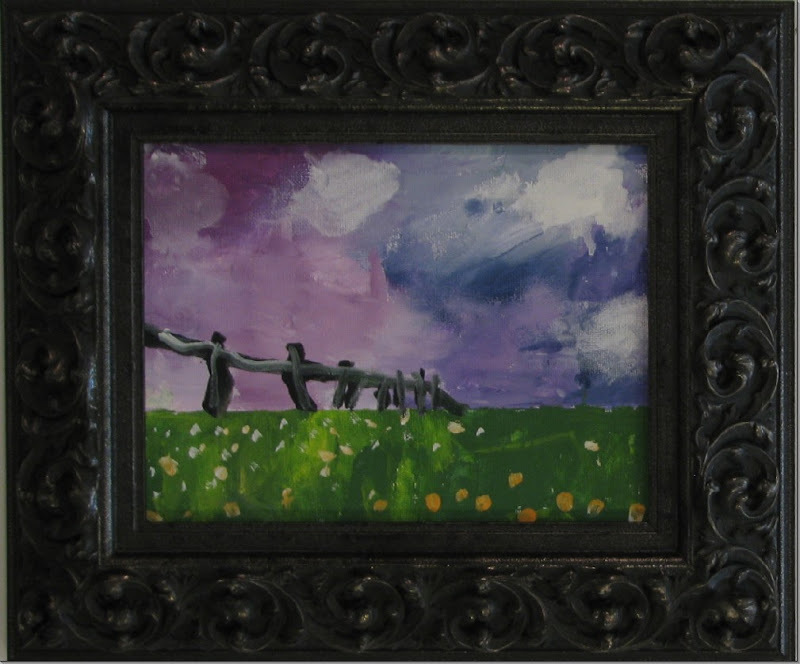 It’s always nice to frame your childrens’ masterpieces…. and you get the artist discount too! Looks like this moulding was made for this painting.